MakeBelieve Arts has been pioneering this work in the UK since its conception in 2002. In its simplest form children tell their stories which are written down verbatim, word for word. The group then gathers around a taped out stage and the stories are acted out. 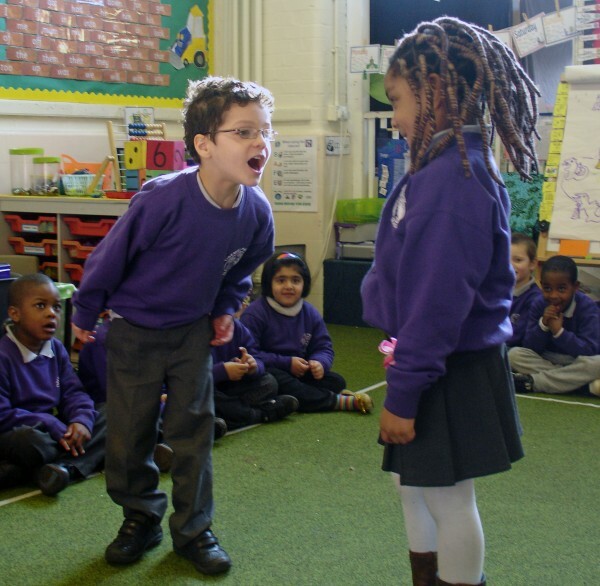 Alongside the simplicity of this approach is an ethos that is child-centred, creating a culture of curiosity and wonder at the dexterity of children’s imaginings during both the telling and the acting out of their stories. Ggggggrrrrrh, Ggggggrrrrrh, Ggggggrrrrrh, Ggggggrrrrrh,Ggggggrrrrrh, Ggggggrrrrrh, Ggggggrrrrrh, Ggggggrrrrrh, He scares the people away. He scares the people in the garden. My monster is raaaaah Then he scares my monster away, in the house. Every time Zandra growled at me, I repeated her sounds, exactly as she said them, before writing her story down. The pattern went like this, Zandra growled, I growled back. She put her hands over her ears, we smiled at each other, reassuring ourselves that it was just a game. Then she looked at the paper I was holding, to watch as I wrote and growled her words down. Another growl and the pattern repeated. There were eight growls in all, and each was accompanied by exactly the same ritual. Her teacher sat next to me. She had already informed me that Zandra had delayed language development and that she was also a bit shy. Once the growling was over, Zandra smiled. It looked like the story was finished, so I placed my book upside down on my lap, thinking my job was done. But I wanted to know more. I was curious. So I asked a few questions. And then Zandra surprised us all. She turned my book over, looked at the page where I had written her story and continued to dictate. “He scares the people away.” I repeated her words back to her as I wrote, and then she was off, telling her story of the monster who scared people from the garden, and who is then scared into the house. The teacher was surprised, Zandra rarely spoke and yet her story is strong, articulate and follows a very clear narrative progression. The monster scares people and then the monster is scared away. We shouldn’t really be surprised. Zandra did what children all over the world are doing, she made up a story. She started from a place that was safe for her, using sounds and growling to communicate her message, and then she found her voice. The fact that Zandra found her voice is incredible. The fact that she did it through a story about monsters, and that every time I growled at her she backed away and covered her ears, reminded me of how many fears we have to work our way through to be able to talk. Being confident to speak, to share your story with another, is a brave thing to do. And yet it is something our children are boldly doing every day in their fantasy play. Seeing the light in Zandra’s face as she dictated to me, was proof of the joy she found in the telling. If we want children to talk to us, let’s give them meaningful reasons to communicate. What better reason is there, than to share a story that will be acted out? This approach is called Helicopter Stories, Letting Imagination Fly. It is based on the work of Vivian Gussin Paley and has been developed by MakeBelieve Arts over the past thirteen years. In its simplest form, children tell you their stories and you write them verbatim, word for word, exactly as they are dictated. At the end of the morning, the class gathers together around a taped out stage, to act these stories out. The benefits are phenomenal. Here is a chance to value the imagination of the children in your classroom. To find out what lies behind the growls and the claws as the monster approaches, and to give children a reason to share what they know. I was in the nursery for 6 weeks. On week 6, as usual, I asked her once more. This time she didn’t stare through me. She smiled a half smile, looked me in the eye, and then placing one hand over her mouth she whispered in my ear. I wrote her story down. Can one word be a story? The five year olds in Vivian Gussin Paley’s classroom thought it could. They reminded Vivian that, “it’s not one word, it’s one person.” So yes, a person can be a story, and Amina’s story was Princess. When we came to the acting out, Amina stood up and walked around the stage, her nose in the air, every bit the haughty princess. Everyone was surprised that she’d told a story. But maybe we shouldn’t be. For story is the language of children. If we want our curriculums to be compelling, then story must be at the heart of it.Fantasy play is the tool that children are born with to make sense of the world. 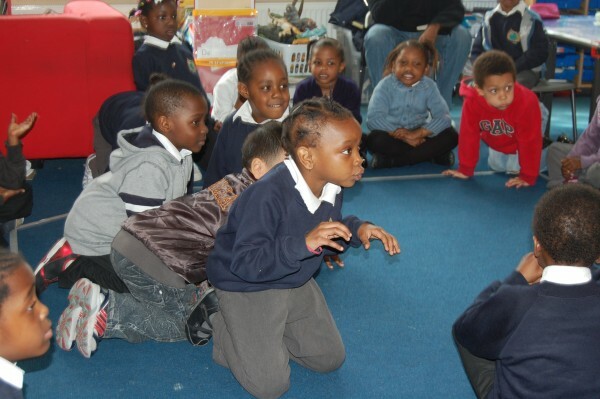 If we incorporate storytelling and story acting into our classrooms we give this tool centre stage, and enter the world of the children, where we learn their language and of course we find wonderful surprises. Trisha Lee is the Artistic Director of theatre and education social enterprise MakeBelieve Arts. Trish founded MakeBelieve Arts in 2002 and is widely known for her work on Helicopter Stories, she is in demand to speak at conferences and deliver INSETs for teachers. Based on her work in theatre and education, her ability to link current educational theory with theatre practice and a passionate interest in how children learn, Trish written and co-written a variety of books. Her new book Princesses, Dragons and Helicopter Stories: Storytelling and Story Acting in the early years is due to be published by Routledge in autumn 2015.